A small group of us were hanging out at Canaveral Jetties and discussing what the waves might be like out around the Cape. We all knew those beaches were off-limits. Then someone mentioned that on really big days that waves break several miles out where the outer shoals are surrounded by 40 foot debths. "Surfing an outer shoal?" This really got my interest. I had limited experience boating around the sandy shoals off North Carolina's Outer Banks. Several times I had caught great waves on the shoals between Shakleford Banks and Cape Lookout. One of the guys said his next door neighbor would probably take us out there. The neighbor was an 18 year old non-surfer who had permission from his Dad to take the family boat out for fishing. The boat was about 24 feet long with a center console and a 115 hp Mercury outboard. He knew the way out through the Canaveral locks and was familiar with the shipping channel and the outer buoys. Our opportunity to expore the shoals presented itself the very next weekend when tropical storm Heidi was briefly coming our way. Heidi was northeast of the Bahamas and now sending us an overhead groundswell with no wind effect. Most of Cocoa Beach was closing out the day before, so we decided to head out to the Shoals early the next morning. Three of us ventured out to surf the shoals and were not prepared for all that was to happen that morning. We packed a cooler full of sandwiches and sodas. I was happy to see his boat had a little bimini top to offer some shade if we stayed out for the day. I worried that I would sunburn since I had left my zinc oxide in my apartment. Little did I know that sunburn would be the least of my worries that day. Heading out through Canaveral Inlet we watch about 30 surfers catching some fun chest-high waves inside Canaveral Jetties. One of the surfers, a guy named Bernie was recognized and we invited him along. He paddled over and climbed in. We could really feel the groundswell as we cleared the old ash can buoy just off the jetty. The ocean was smooth glass. The groundswell were kinda fun to boat over. We could see lotsa waves breaking on other sandbars just off the Cape. We stayed in the channel and decided to travel out as far as we could see anything breaking ... that looked rideable. After about 20 minutes we saw fewer waves breaking on the sandbars, but did see occasional sets breaking way out to the left of the shipping channel. We estimated that we were about seven miles out. We slowed as we approached the outer shoal. The water color was changing from that deep water, dark blue look to more of a Caribbean look as we approached more shallow water. Then we saw our first really big set. The waves were a solid 8 feet and the shape was perfect. We watched peeling top to bottom lefts move over the outer shoal, then soften as they approached the channel. The broken waves would continue for about a hundred yards then flattened out as they hit the deep water just outside the other sandbars. We were really excited! I was concerned about getting to close to the break with the boat. There didn't seem to be much drift but I was still worried about rogue sets. We thought we saw a medium size shark under the boat, but realized it was a cobia enjoying the boat's shade. "Do not anchor and do not turn off the motor" I told the guy with the boat as we glided to a stop. The three of us threw our longboards in (no leashes back then) and paddled over to the take off zones. I lost my board on the 1st wave but it drifted out to the deep water and I got to it easily. There were lotsa fish running around the edge of the shoal. That didn't bother me too much at that point cause I had boated out to similar outer shoals off the outerbanks and was kinda use to the feeling. We had surfed for a while when we saw this big rogue set coming. I looked over to the boat expecting him to swing a little towards the channel ... just to be safe. Then I watched the stern of the boat rise sharply as the bow of the boat was yanked down into the face of the approaching wave. "Oh, no ... he anchored!" The wave swamped the boat and washed out our cooler, life vests, shirts, towels, paddles and killed the motor (or maybe he had turned it off, I don't recall for sure). The next wave almost filled the boat with water. He freed the anchor from the cleat and the last wave hit hard and pushed the boat further away from us. We start paddling to the boat when we saw the sharks. The three of us immediately knew we were in grave danger. There were no waves we could ride seven miles back to the safety of shore. The boat was about 50 yards away and the shoal was not shallow enough to escape them. I saw 2 very tall and narrow fins.They were cruising past the boat near the edge of the shoal. We had no option but to paddle to the boat anyway and take our chances. That was an incredibly scary moment. We knew for certain that one or all of us were going to get bitten. 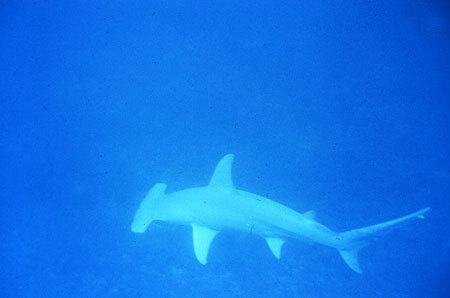 A large hammerhead emerged from underneath the boat, but quickly moved away from us. Our hearts were pounding as we all knee paddled to the boat as fast as we could. We all made it to the boat OK. But the really scary part was that little bit of time that it took to climb up into the boat. Bernie had built up a lil paddling speed as he approached the boat then jumped to his feet and tried to jump up into the boat off his board, but all he did was kick his board out from under him and he busted his mouth open when he hit the boat's side railing. He fell back into the water with blood flowing everywhere. There were more sharks now and several very near us. We were back in the deep blue, deeper water. I was afraid of the sharks that we couldn't see that might be deep beneath us. At this moment we are all scrambling like crazy to get in the boat ... and we all do safely. The boat drifted out of the surf zone. Our boards were still in the water. 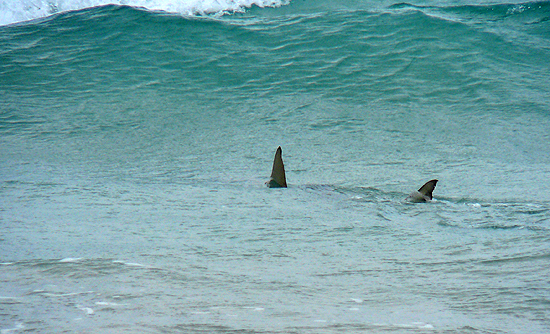 And, for the 1st time we could clearly see the sharks and noted that the hammerheads were longer than our longboards. Watching the hammerheads cruise by and under the boat gave us a great view of their unusual shape. Somehow they did not appear so menacing, but I knew they were very dangerous. We finally restarted the motor, retrieved our boards and most of our stuff. Bernie had busted his nose, cheek and top lip open, but seemed OK. He was still visibly shaken. We had seen several Hatteras style boats heading out when we were still adrift but none stopped. Maybe they were too far away to see we needed help. But just as we were running back in, a party boat came right for us. We slowed to hear the Captain say he had received a radio call from one of the boats we saw earlier to check us out. We told him what had happened. Captain said we were nuts and was not sympathetic. "Why did you anchor?" he asked. The next trip I made was with a different group of guys a couple years later during a fall North East swell. This time the water was not as clear and there was a steady Northeasterly breeze. The size was double overhead and hard to judge the takeoffs. I was very nervous and, after surfing less than an hour, encouraged the others to not push our luck and return to the boat. I couldn't believe that I was making the nightmarish paddle back to the boat again. Back on board we began to see lots of sharks. They were everywhere! Looking back ... I enjoyed the great waves and the thrill of surfing Canaveral's South East shoal. Since then I have talked to many fishermen and divers who frequent that area. They see sharks everytime they are on the shoals. "It is a major shark feeding area" I was told. 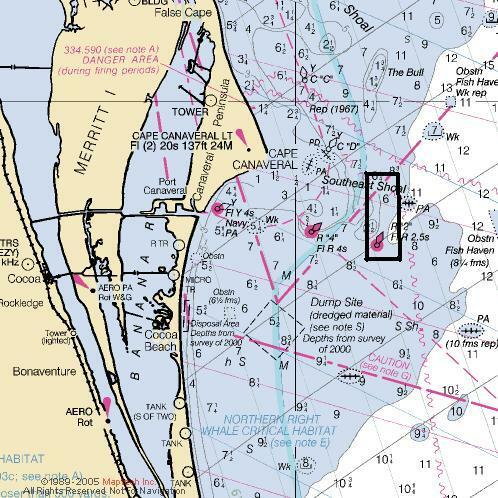 "They go after the cobia and tarpon that frequent that area." I consider myself fortunate to be one of the few that actually surfed the spot. And, I do consider myself very lucky that I survived it ... twice. Me surf the outer Canaveral Shoals again? Nope. Me go with anyone as a guide? Nope, sorry.